HUDSON: Well, as soon as Obama made those words, there was a fury of European statements saying that Obama and NATO was making Europe less secure. The French prime minister, Francois Hollande, says that we don’t need NATO. 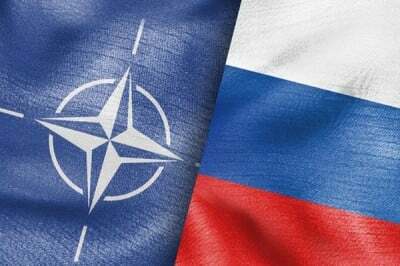 NATO has no role to play in our Russian relations. That leaders of the two major German parties, both the Social Democrats and the Christian Democrats, said that NATO was warmongering. Gorbachev came out and said the world has never been closer to nuclear war than it is at present. William Perry, the former head of the Pentagon in the mid-90s, said that NATO was threatening and trying to provoke atomic war in Europe. And one of Russia’s leading military strategists said here’s what the problem is: NATO wants to move bombers and atomic weapons right up to the border of Russia. That means that if they launch over us, we have only a few seconds to retaliate. President Putin a little while ago had given a speech saying that Russia doesn’t really have a land army. In fact, today, no country in the world, in the Northern Hemisphere, at least, has a land army that can invade anywhere. Try to imagine America being invaded by Canada, or by Mexico on its borders. You can’t imagine it. Impossible. No democracy can afford a land army anymore because the costs are so high that the costs of mounting a land war will just impoverish the economy. As a matter of fact, what NATO is trying to do is to goad Russia into building up an army so it can undercut its economy by diverting more and more resources away from the economy towards the military. Russia’s not falling for it. Putin said that Russia has no intention of mounting a land army. It is unthinkable that it could even want to invade the Baltics or Poland. But Putin did say we have one means of retaliation, and that’s atomic bombs. Atomic weapons are basically defensive. They’re saying, we don’t need an army anymore. Nor does any country need an army if they have an atomic weapon, because if you attack us we’ll wipe you out. And we’ll be wiped out, too, but you’re never going to be able to conquer us. And no country, really, can conquer any other country. Russia can’t conquer Europe. So the effect, Putin and the Russian leaders have said, look, if they suppose that an American plane goes a little bit off, like, you know, the ships try to provoke things, we don’t know whether it’s an atomic attack at all. We can’t take a risk. If there’s a little bit of a movement against us, we’re going to launch the hydrogen bombs, and there goes Berlin, Frankfurt, London, Manchester, Brussels. That’s why you’re having all of these warnings. And Europe is absolutely terrified that Obama is going to destabilize. And even more terrified of Hillary getting in, who’s indicated she’s going to appoint a superhawk, the Cheney protege Flournoy, as Secretary of Defense, and appoint Nuland, Victoria Nuland, as Secretary of State. And all throughout Europe–I’ve been in Germany twice in the last two months, and they’re really worried that somehow America is telling Europe, let’s you and Russia fight. And basically it’s a crisis. Now, look at what’s happening in Europe. It’s not even growing 2 percent because of the austerity that’s being imposed on it. So 2 percent is the entire annual economic growth in Europe. This large amount has to be spent on American arms. So it turns out that this sabre-rattling to Russia merely means, is a means of obliging the European countries to pay the United States arms manufacturers for goods, and to basically hold you up, Europe up for ransom, saying if you don’t be a part of this, we’re not going to defend you, and Europe is saying, well you know, we really don’t need defense. We’d rather have an economic relationship with Russia. Especially the Germans say, we don’t want the sanctions. The Italians say, we don’t want the sanctions. We don’t want you to make money off Russia. Buy from us, not from Russia. Buy your agricultural goods and your other goods from us, from countries in the dollar orbit, not from the Russian orbit. And that, essentially, is what Obama meant by the reset. It meant a new Cold War, but the essence of the Cold War is to fight in the new way, which is a financial war, with the military only being a kind of catalyst for the financial warfare between the United States on the one hand. And it’s now–the first effect of the reset–was to drive Russia into an alliance with China. And now, NATO may be overplaying this right-wing hand so much that it’s driving Germany and Italy and France out of NATO. That is the effect this is–what it’s doing is rather effective. This is Brzezinski’s plan in Afghanistan, you know, way under the Carter administration. If you can force Russia to pay more for its military to defend Afghanistan, then its economy would buckle and you’ll have discontent there. And then the Americans can come in and promote nationalist and other localist breakups, and try to break up Russia just as America is trying to push a breakup of China as a long-term strategy. And this is going–there’s no way that this cannot backfire on the United States. HUDSON: Essentially to dissolve NATO, which France has been pushing now for many years. There’s no need for NATO now that there’s no threat of any military invasion anymore. Remember after World War II, NATO was put up when there was a thought that, well, the first idea is European countries should never go to war with each other again. There will never be war between France, Germany, Italy. That’s been solved. There’s no way in which European countries would go to war. The second thing was, well, what if Russia would re-invade like it did when it fought against Hitler? Well, there’s no danger of Russia invading anymore. In fact, in 1990, when the Soviet Union broke up, the Ukraine passed a resolution that it wanted to remain neutral and benefit from its sort of neutral pivot between Russia and Europe. And the United States put $5 billion into Ukraine, and spurred a lot of nationalist revolution. And so it took the United States 20 years to turn that around and to somehow break up this neutrality. So the U.S. strategy is to prevent neutrality. Europe’s economic interest is to achieve neutrality with Russia, and have economic unity so that there’s little chance of any confrontation with Russia as there is among the European countries themselves.